You’ll notice that the small extruder wheel is black, this is because the one from the kit broke. We managed to glue it back together and it held long enough to print a replacement in black PLA. It turned out that the MOSFETs that were supplied in the kit (P55NF06L) could not deal with the current required for the heated bed. One burned (literally!) and the spare one immediately did the same thing. We replaced them with the International Rectifier IRLB8743PBF which is much beefier and everything has been working fine since then. We added two cooling fans: one for the electronics (the black thing you can just see behind the extruder stepper motor) and a smaller one aimed at the nozzle. We printed a mount for this one and a 50mm to 40 mm adapter, herpes under tongue more about that later. Adding the fan immediately improved the quality of our PLA prints. We are working with some green PLA now which tended to sag; cooling it with the fan makes printing detailed features and bridging gaps much easier. 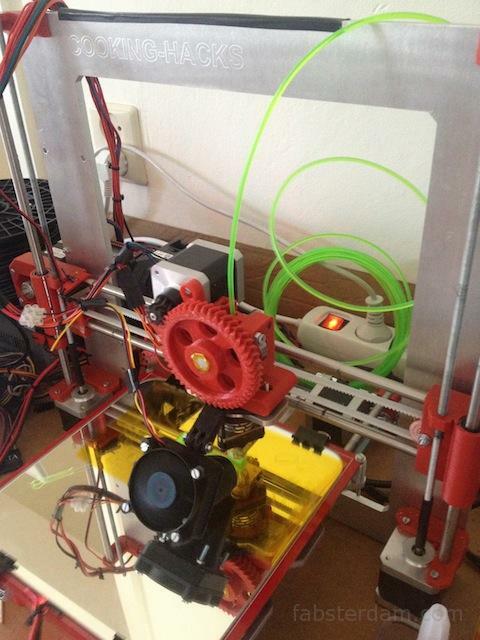 Up next will be building a spool holder for our filament, we’ve already seen several nice ones on thingiverse.com. We’d also like to print a replacement for the left part of the X-carriage assembly because it cracked in several places during assembly (not because we were so rough but because the piece was warped).